Make about a cup and half of thin coconut milk and one cup of thick coconut milk and keep aside. Fry green chillies, cloves, ginger, and curry leaves for about half a minute. Add the sliced onions and fry till they turn soft. Do not let them turn brown. Make a little space in the middle of the pan and heat the garam masala for about 20 seconds. Fry together with the onions. Add the chicken pieces and potato and stir fry for a minute. Pour thin coconut milk into the pan and stir for a minute. Now you can either transfer the stew to a deeper pan or a pressure cooker. If you are using a cooker, transfer contents and cook for about two whistles. Let the cooker cool. If you are using a deeper pan, make sure chicken is soft and well cooked. 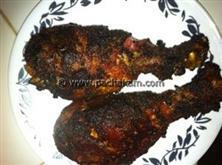 :- If there is too much water, cook without the lid, till the gravy just covers the chicken pieces. Take it off the stove and add thick coconut milk till you have a nice thick white stew. :- Do not continue to cook with the milk added because it may separate. Sprinkle pepper, check for salt and your stew is ready. 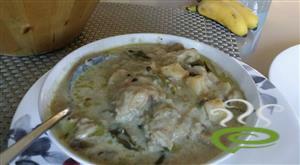 :- Substitute cut vegetables like Beans, Peas Carrots, mushrooms and Cauliflower and you have Vege Stew. :- Substitute beef or lamb , you have the named stew. 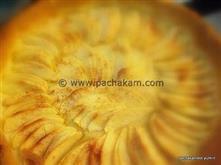 :- Serve with Chappatis, Parathas, Bread. Today I tried chicken stew.it was superb....thank u so much.. I have tried this recipe.. its really good...used just half kg. of chicken.. Thanks for the excellent recipe. This was my first experiment for a chicken stew and it worked out well.Its a favourite dish for children also. Thanks Rashmi ! Really tasty ! This is one yummy recipe.....thanks Rashmi for sharing it with us ! This recipe is definitely worth trying again & again - Quick n tasty! Excellent recipe, I am quite happy with the outcome. Hi Rashmi. Imade this yest 26.09.2007. came out very well. Just 2 points though. You have not mentioned when to put garlic (which i added alongwith the ginger) and I suggest the potatoes are added a little later in the curry as it got mashed/cooked too much when I put it at the same time as the chicken. But it was awesome...thanks. Thanks Guys! I am glad you liked it. wow....tried your chicken stew,it tastes great........thank you. How on earth are u supposed to make chicken stew without specifying the amount of chicken???? If u add tomatoes it will be more tasty.